Refresh tired, limp or dull hair for stunning results. Infused with extract of White Tea it won't weigh your locks down. A gorgeous tropical fragrance combining sweet apple, mango and pineapple with a hint of jasmine and rose, refreshingly delicious. Reasonably priced. Cleanses and lathers well. A really nice daily wash shampoo. Feels particularly good if your hair is feeling greasy. Gives a good fresh feeling. Nice smelling too. 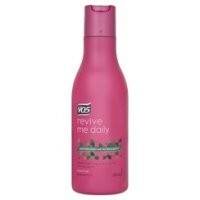 Lovely vibrant bottle, easy to use, great scent, cleanses well and lathers well. I really like this range from VO5. This particular shampoo has a great scent, easy to use and leaves hair looking really good. Nice and cheap to buy and lasts a while as you do not need loads for a really good lather.